Duncan Tonatiuh and Margarita Engle. Forty teachers came to the Américas Award and CLASP K-12 teacher workshop on September 17, co-sponsored by Teaching for Change. Participants had the pleasure of hearing first hand from the award-winning authors, Duncan Tonatiuh (Separate is Never Equal: Sylvia Mendez and Her Family’s Fight for Desegregation) and Margarita Engle (Silver People: Voices from the Panama Canal). Teaching for Change’s director Deborah Menkart facilitated an introductory activity based on the themes from both books. 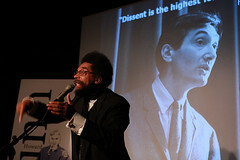 In a “people’s bingo,” participants were invited to find peers who could respond to specific prompts such as, “Has family members who were active in the Civil Rights Movement,” “Went to a segregated school,” “Has visited (or is from) Panama or another Central American country,” and many more. In addition to the presentations and activity, attendees received dinner, teaching resources, and signed copies of both books. Here are photos from the workshop. The Américas Award is sponsored by CLASP and coordinated by Tulane University’s Stone Center for Latin American Studies and Vanderbilt University’s Center for Latin American Studies. 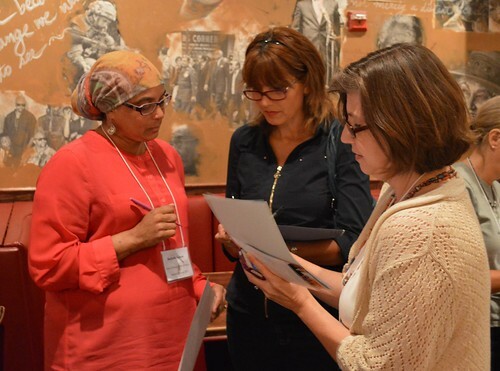 Teaching for Change has partnered with the Américas Award and CLASP since 2008 on outreach for their ceremony at the Library of Congress and more recently on planning for the teacher workshops.